Each year we take a trip back to Texas for Christmas. Usually we stay with family and friends. However this year we ended up staying in a hotel when we visited The Big Guy’s hometown of Bryan, Texas. Used Hotwire to book our hotel and were pleasantly surprised by the hotel. We stayed at the LaSalle Hotel. The LaSalle was originally opened in the 1920’s . In 2000, it was restored and reopened. The Downtown Bryan Association and others have put a lot of effort in restoring the historic downtown area. Unfortunately due to lack of time and my broken ankle I didn’t get many pictures. I did get this from out hotel room of the Carnegie History Center across the street. 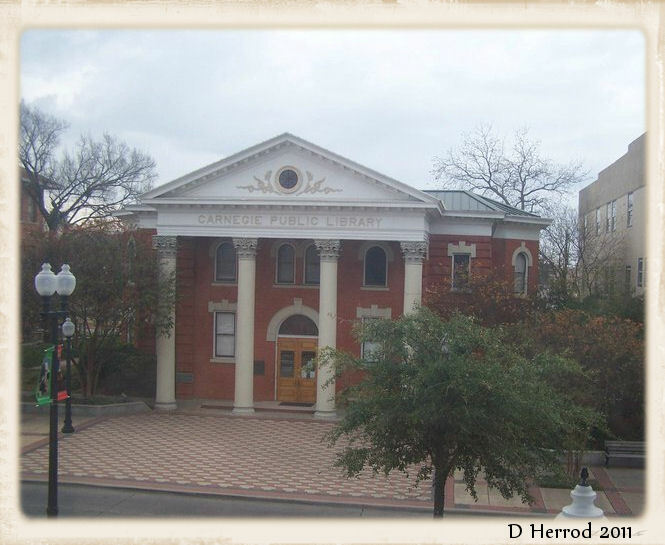 Built in 1903 the Carnegie History Center is the oldest operating Carnegie Library in Texas. Andrew Carnegie about a grant for city library. Carnegie believed in the value of self-education and made offer to build a library for any city in the U.S. that would agree to provide a budget equal to one tenth of the construction grant annually to maintain the library. In 1902, a representative for the Mutual Improvement Club leaders contacted Carnegie. The city of Bryan agreed to proved $1,000 per year for the library. The library was designed by Texas A&M College Professor Fred R. Giesecke. The building is a Greek Revival Style, in a Greek Cross plan, the building was to be of red brick and fronted by four enormous Greek Corinthian columns topped with acanthus leaves. The library first opened to the public December 1903. It was restored in the 1990s. Previous Diploma or No Diploma? Very interesting post and great shot of the library. I love going to Bryan for another reason. I believe that is were the Blue Bell ice cream plant is located. Blue Bell is in Brehenham. Both are in the Post Oak Belt. Thanks for commenting on my entry. It’s informative entry and I could learn new things. Such a classy library; in earlier times public buildings have been build to impress and Greek style was very “cool”. It is just interesting to see how public building styles have changed.